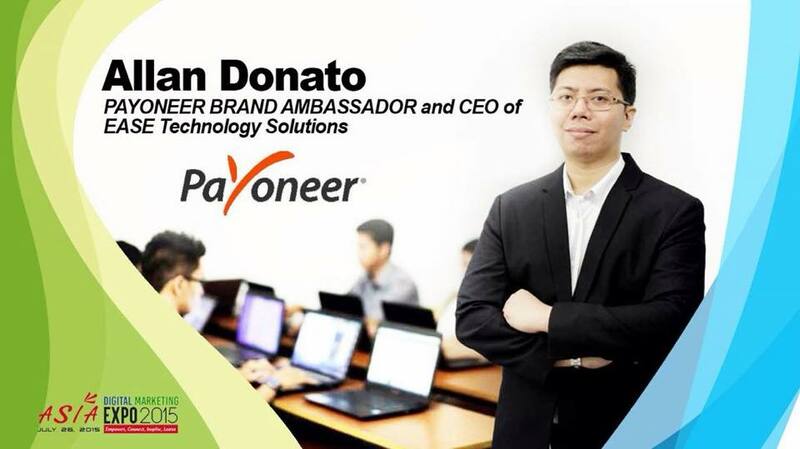 Payoneer joins Asia Digital Marketing Expo 2015 with Philippine Brand Ambassador Allan Donato. TAG Media and Public Relations Chief Executive Officer Engr. Grace Bondad Nicolas was happy with the overwhelming support received from Payoneer and that includes as Mr. Donato as one of the speakers to discuss the E Commerce industry in the Philippines and beyond, side by side soon with Constantin Robertz of Zalora, Janette Toral of Digital Club Filipino and Robert Yupangco of Yupangco Group of Companies. #AdMe is presented by TAG Media & Public Relations. For more info please check www.asiadigitalmarketing.ph & for partnership/sponsorship, please contact the organizer at 09166299381 or at grace@asiadigitalmarketing.ph Registration Regular Rate Php 2,000.00 on or before July 25, 2015. Walk Ins, Php 2,500.00. To confirm the registration. Here are the 3 easy steps; 1. Please deposit the registration fee of Php 2,000.00 to TAG Media and Public Relations BPI Checking Account # 1680 0010 29. 2. Scan the deposit slip. 3.Send the scanned copy of the deposit slip to grace@asiadigitalmarketing.ph You will receive a confirmation email after. TAG Media and Public Relations is the organizer of Asia Digital Marketing Expo 2015 and handling corporate companies for Marketing, Branding, Business Development, Strategic Planning and PR. This entry was posted in Swoosh News and tagged 2015, adme, asia digital marketing expo, Payoneer. Bookmark the permalink.